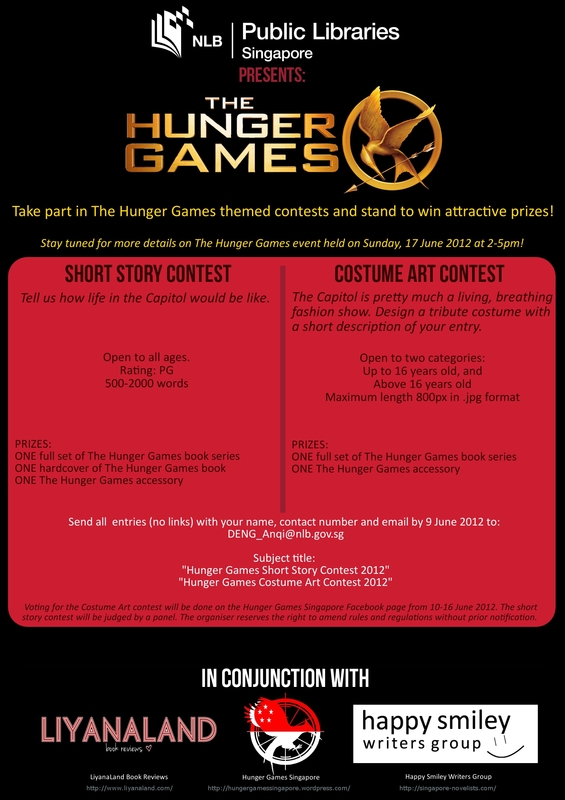 The Hunger Games: Catching Fire Singapore Challenge! ATTENTION, ATTENTION ALL TRIBUTES OF DISTRICT SINGAPORE! Want to win an all-expense paid trip to The Hunger Games: Catching Fire premiere in Los Angeles, California? Enter your name into the reaping bowl (er… registration form) and you may just get reaped as a tribute for The Hunger Games: Catching Fire Challenge on 9 November 2013! 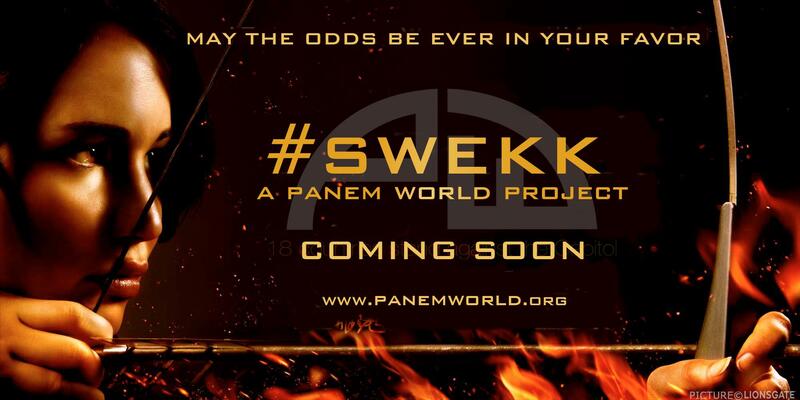 We are please to announce Hunger Games Singapore will be taking part in a Panem World project titled #Swekk. As for what it’s about…you just have to stick around to find out! P.S. We promise you will love it! We had reported yesterday regarding a rumour on Lionsgate is considering between Armie Hammer, Taylor Kitsch and Garrett Hedlund as the top three candidates for Finnick Odair. However, ZAP2IT reports that there are currently no shortlisted candidates for Finnick Odair yet. …sources close to the production tell Zap2it that casting has just begun for the role, and that the three All-American dudes are by no means the only ones in the running. The scenes the actors are reportedly reading for the role include the sugar cube scene where Finnick first meets Katniss and the scene where he hears Annie’s scream. What do you think of the reportedly audition scenes that actors has to read for? RUMOUR: Armie Hammer, Taylor Kitsch and Garrett Hedlund considered as Finnick Odair? E! 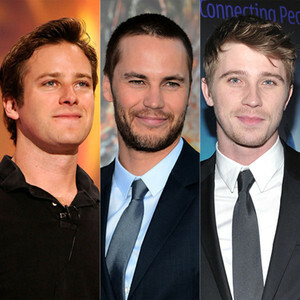 Online heard from a source stating Lionsgate is considering between Armie Hammer, Taylor Kitsch and Garrett Hedlund. The source also says that a final decision from the studio may be announced as early as this week. However, another source says the studio may also be looking at unknowns à la Brad Pitt in Thelma & Louise. All three actors come with star status. Hammer will next be seen playing the title role in the Lone Ranger flick opposite Johnny Depp as Tonto. Tron Legacy’s Hedlund was also a big Cannes Film Festival headline with the premiere of On The Road with Kristen Stewart and Kirsten Dunst while Kitsch can currently be seen in Battleship. Reps for the three did not comment. Please consider this as a rumor unless it is confirmed by Lionsgate. What are your thoughts on Armie Hammer, Taylor Kitsch and Garrett Hedlund if one of them will portray Finnick Odair? Or do you prefer an unknown instead? According to Deadline, ‘The Hunger Games’ scores a final US$152.5 million for the opening weekend in North American box office. Although it was lower than the originally estimated US$155M, ‘The Hunger Games’ still manages to hold the position of 3rd biggest opening weekend in North American box office just behind ‘Harry Potter and the Deathly Hallows Part 2’ and ‘The Dark Knight’. It’s no surprise that ‘The Hunger Games’ is topping box office internationally and locally too with The Wrap reporting so. In Australia, the movie opened to US$9.69 million, comparable to “Harry Potter” and “Transformers.” In New Zealand, it took US$1.27 million. “The Hunger Games” opened to US$7.49 million in the U.K., US$6.5 million in Russia and US$3.7 million in Scandinavia, where markets are combined. It did $3.9 million in Germany, US$3.75 million in France and, according to early estimates, US$3.59 million in Mexico and US$2.6 million in Brazil. Moviegoers in Asia turned out in strong numbers, as well. 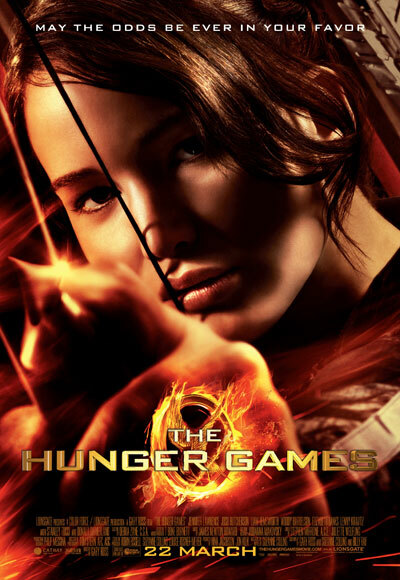 In the Philippines, where the “Twilight” franchise is especially popular, “The Hunger Games” opened to US$1.71 million. In Singapore, it took US$1.38 million, in Taiwan it took US$1.36 million, in Hong Kong it took US$709,000, in Malaysia it took US$655,000 and in Thailand it took US$649,000. Lionsgate has released this new TV spot where Liam Hemsworth, who plays Gale Hawthorne in ‘The Hunger Games’, thanked fans for the support and also includes footage from the 74th Hunger Games arena scenes. With ‘The Hunger Games’ selling well worldwide, we are sure this is a great start for a new franchise. Do you think it will do as well for ‘Catching Fire’ and ‘Mockingjay’? If you have seen ‘The Hunger Games’, will you be watching it again in cinemas and if yes, how many times are you planning to watch it? The Wrap reports ‘The Hunger Games’ has smashed even the most optimistic grossing predictions for the experts are now predicting it to rake in US$155 million for its opening weekend in North America. “The Hunger Games” beat even the most optimistic box-office expectations in its debut weekend, grossing an estimated $155 domestically million and setting several records. Lionsgate’s movie opened bigger than any movie ever to open in the period between January and April. It is the biggest non-sequel opening ever and the third-biggest movie opening ever. The movie is about a dystopian future in which the government of the North American nation of Panem punishes its population for a long-ago rebellion by forcing children — a girl and a boy — from each of its dozen districts to fight to the death in an annual, nationally televised spectacle. “Hunger Games” was the only major film to open this weekend. Last week’s No. 1 movie, Sony’s “21 Jump Street,” fell to No. 2 in America, taking a respectable $21.3 million. That’s a 41 percent drop from last week. Lionsgate did not announce its pre-release expectation, though outside box-office watchers predicted the PG-13 rated movie would exceed $120 million. The movie, based on Suzanne Collins’ bestselling young adult novel, cost about $100 to make — $80 million after tax incentives. Its midnight showing was the biggest ever for a non-sequel: $19.7 million. In all, it took $68.25 million on Friday and $51 million on Saturday. Lionsgate estimates the movie will gross $36 million on Sunday. It did $10.6 million on IMAX screens alone. That averages $40,000 per IMAX screen — a record for an IMAX digital release. The previous high was $6.4 million for “Thor” in 2011. Even before the film opened on Friday, it was a phenomenon. Days before it was released, it had sold out nearly 2,000 screens, according to the online ticketing company Fandango. MovieTickets.com reported the same: nearly 2,500 screenings that company offered had sold out going into the weekend, and more than 450 screenings for Sunday through Thursday are sold out. The opening weekend audience made up mostly of females — 61 percent of audience members were female, and 56 percent were 25 and older. At IMAX locations, males outnumbered females, though the company did not have precise numbers Sunday morning. We have also previously reported about ‘The Hunger Games’ grossing record breaking US$68.25M on Friday in North American box office. Deadline is also reporting ‘The Hunger Games’ having scored US$58.7M from global box office sales and breaks down why ‘The Hunger Games’ is breaking records even though it’s a non-sequel movie. These numbers are expected to increase as the days go by. What made Lionsgate’s promotional campaign for The Hunger Games so unusual and probably effective was that the studio stuck to the rare strategy of not showing any footage of the games themselves in any marketing materials. So all that staggering amount of interest in this film was incited with no one having actually seen even a hint of over half the movie. Marketing kicked off last summer with 2 Entertainment Weekly covers during production to announce the cast, as well as the launch of the motion poster of the iconic flaming mocking jay. (Since EW has long been the semi-official mag of the Twilight Saga, Lionsgate took a page from Summit — which it now owns.) ABC’s Good Morning America debuted the entire trailer on air in November. Between the release of the first Hunger Games trailer in November 2011 and January 2012, the number of Collins’ books sold nearly doubled. By the time of the film’s opening, Hunger Games was on over 50 magazine covers. The studio estimates its TV on-air promotions and sponsorships reached over 102 million people in America. They included a 3-night “studio lot sponsorship” on FX movies, Fangasm spots on MTV featuring the Real World Challenges cast, a Comedy Central ‘Action Countdown’ weekend, and an ABC Family ‘Premiere Party’ during the Season 2 finale of Pretty Little Liars where teen female viewers helped break social media records while twittering about a clip featuring fan favorite Peeta. According to SocialGuide, this generated the most social media buzz for any one-hour TV episode on record. The digital campaign was massive and started with the launch of the cast on The Hunger Games‘ Facebook page, then exploded over the past year with its own blogs. Lionsgate also worked exclusively with Microsoft to create games and apps. Publicity-wise, the film had an 8-city mall tour with thousands of fans at each stop around the country, as well as promotional screenings in 26 markets. The film had 5 premieres globally, starting in LA at the Nokia, and then London, Paris, Berlin and NYC. Stay tune as we wait for actual figures to come in. 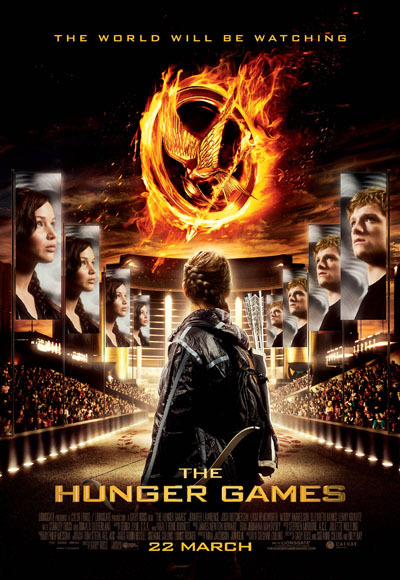 ‘The Hunger Games’ was released on 22 March 2012 in all major cinemas islandwide. ‘The Hunger Games’ is certainly doing well internationally with Deadline reporting it opening to around US$1.8M (S$2,269,980) in Australia and raking in US$19.75M with only North American Friday midnight shows and groundbreaking US$68.25M for Friday, which is the opening day, North American box office sales. This marks the 5th highest Friday sales ever in North America. Experts are predicting US$140M opening weekend sales and possibly higher. As for the actual numbers, we will know soon. Read more below. FRIDAY 11 PM, 6TH UPDATE… EXCLUSIVE: My sources tonight say TheHunger Games is looking to open humongous with $66 million for Friday box office from 4,137 theaters in the U.S. and Canada, including the record $19.75M in midnight shows. An insider tells me that ”$70M is still a possibility for Friday with a little swing here or there”. And one rival studio exec explains to me, “The West Coast and late shows still need to come in, so this number could bounce around a bit. But, nevertheless it’s everything we thought it to be.” That puts its 3-day North American weekend gross at a gigantic $138M with a lot of upside. Adding to the great reviews around the globe, domestic audiences gave The Hunger Games an ‘A’ Cinemascore with under-age 18 teens/tweens rating it ‘A+’. This is the biggest movie start ever for Lionsgate, which now can count on a blockbuster bonanza for its franchise trilogy. “I’ve never lived up at this level. Very few people have,” one ecstatic Lionsgate exec gushed to me Friday night. “I did see some champagne glasses flowing down the hall.” This is not the biggest opening day gross ever, but it is for a non-sequel and/or non-reboot film (unadjusted for inflation) – and certainly an amazing start. It’s within the Top 5 all-time Friday openings which include 1) Harry Potter And The Deathly Hallows Part Two ($91.1M), 2) Twilight Saga: New Moon ($72.7M); 3) Twilight Saga: Breaking Dawn Part One ($71.6M), 4) The Dark Knight ($67.2M); 4) Harry Potter And The Deathly Hallows Part One ($61.7M). Except for #2 Sony Pictures’ holdover 21 Jump Street and #3 Universal’s Dr. Suess The Lorax, other movies couldn’t get traction Friday. Overall, the weekend is looking up +60% from last year. FRIDAY 8:00 PM, 5TH UPDATE… EXCLUSIVE: Lionsgate’s The Hunger Games now has a hefty opening location average right around $12,000. Keep in mind that in many ways there are no ideal comps because the big-grossing films are all holiday and/or sequels and/or summer releases. Whereas Hunger Games, based on the bestselling trilogy of novels by Suzanne Collins, is a March debut of a first in a franchise. Comps include Harry Potter And The Deathly Hallows Part Two – $13,028, which made for a $91.1M opening day and $169.2M weekend; The Dark Knight – $12,219/$67.2M/$158.4M; Twilight Saga: New Moon– $14,504/$72.7M/$142.8M; Twilight Saga: Breaking Dawn Part One– $11,185/$71.6M/$138.1M. FRIDAY 4:10 PM, 4TH UPDATE… EXCLUSIVE: My movie studio sources are telling me that the Friday gargantuan opening box office for Lionsgate’s The Hunger Games is ranging from a low of $60M to a high of $75M today from 4,137 North American theaters. That number includes the record-setting $19.75M midnight grosses. For the 3-day weekend overall domestic blockbuster number, my insiders are predicting a low of $135M to a high near $150M. This is a huge bonanza for the studio and not much less than its motion picture revenue for recent quarters. Meanwhile Lionsgate sources are telling me that the hotly anticipated pic did a matinee per-screen average of $7,800. Now that number is rising past $9,900 at this hour. That’s better than The Dark Knight ($9,806) andTwilight Saga’s Breaking Down Part One ($9,310) but not Harry Potter And The Deathly Hallows Part Two ($11,300) and Twilight Saga’s New Moon ($12,600). FRIDAY 8:30 AM UPDATE… EXCLUSIVE: Lionsgate’s The Hunger Games is already shattering records. Its opening $19.75 million box office result from 2,565 midnight locations set the record for all-time highest-grossing non-sequel midnights ever. It’s also the 7th highest midnight gross of all time. To understand how gigantic this result is, Batman reboot The Dark Knight did $18.5M in midnights on a summer opening in 2008. It’s also the highest IMAX non-summer non-holiday 2D opening of all time, earning $1.3M from 269 IMAX locations. That’s the highest midnights behind Harry Potter And The Deathly Hallows Part One ($1.4M) and Part Two ($2.0M) and more than Transformers 3($1.3M). Huge lines snaked around those North American movie theaters able to schedule midnight screenings. Some locations even arranged to play The Hunger Games continuously during this opening 3-day weekend. Right now theater owners are adding screens every minute for the largest release in the history of Lionsgate with an opening weekend count in excess of 4,127 locations in the U.S. and Canada for 10,000+ prints. 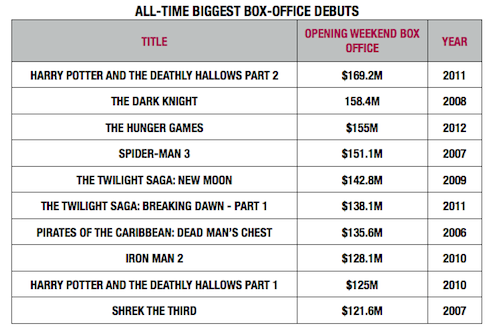 (Right now, that only puts The Hunger Games at #12 on the all-time list of widest openings at the box office. No. 1 is June 2010′sThe Twilight Saga: Eclipse which released into 4,468 theaters.) Also look for a humongous overseas opening worldwide day-and-date on an estimated 7,700 prints everywhere except for handful of markets (which include Spain, Italy, South Africa, Japan, South Korea, Venezuela. On Wall Street, Lionsgate shares bounced around in trading but ended at par. Some of that likely is due to profit-taking and high expectations games. The film/TV studio’s stock price is up 134.3% over the last 12 months. “There is an old market saw ‘Buy on the rumor, sell on the news’ that is likely unfolding,” Piper Jaffray analyst James Marsh tells Deadline’s David Lieberman. Bulls may not want to count on The Hunger Games topping The Twilight Saga: New Moon which generated $142.8M in its opening weekend. 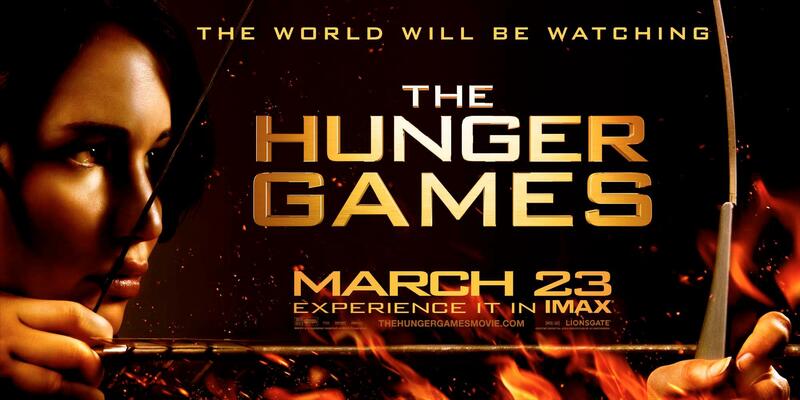 Some traders were concerned aboutThe Hunger Games’ $20M midnight opening which didn’t match the TwilightSaga’s. But the pros likely will sit on the sidelines until they see how the frontloaded film does its second weekend, a far better barometer for a film’s ultimate performance. Fandango is currently selling 12 tickets per second for The Hunger Games which represents an overwhelming 97% of online ticket sales today. More than 3,500 showtimes sold out on fandango in advance of the release. The Hunger Gamesnow leads the list of Fandango’s top franchise-openers, and has eclipsed The Twilight Saga: Eclipse and surpassed The Twilight Saga: Breaking Dawn, Part 1to become Fandango’s #3 advance ticket seller of all-time. According to a recent Fandango survey of several thousand Hunger Games ticket-buyers, 89% said they plan to see the movie on opening weekend, 62% of ticket-buyers planned on seeing the film more than once on the big screen, 54% were going with a group of 3 or more friends.To date, nearly 2,500 screenings offered nationwide by the online ticketing provider for the film’s release have sold out, of which over 1,400 were for last night’s midnight screenings. On MovieTickets.com, The Hunger Games is the #1 non-sequel preseller of all-time, beating out Twilight. Over 10% of all tickets sold for the first weekend release are for IMAX theaters. Visit Deadline for the full article. ‘The Hunger Games’ is featured in this week issue 1118 of 8 Days. Check out the scans of the exclusive interview with Gary Ross, Jennifer Lawrence, Josh Hutcherson and Liam Hemsworth straight from LA and review of ‘The Hunger Games’ movie below. Right click and open the image in a new tab to read for a better reading experience. This issue of 8 Days can be found in all newsstands islandwide at $2 per copy. Following ‘The Hunger Games’ release in Singapore yesterday, 22 March 2012 edition of The Straits Times had a feature article in Life! section which also includes an interview with Hunger Games Singapore team. ‘The Hunger Games’ was also reviewed by The Straits Times staff and given a 4/5 stars rating. As The Straits Times coverage on ‘The Hunger Games’ was huge, we were unable to scan it. However, pictures were taken and these are relatively clear enough for you to read as long as you right click and open the images in a new tab to maximize it. We would like to thank The Straits Times reporter, Yip Wai Yee, for the interview. We are truly honoured to be able to speak to you about our love and passion for ‘The Hunger Games’ franchise.